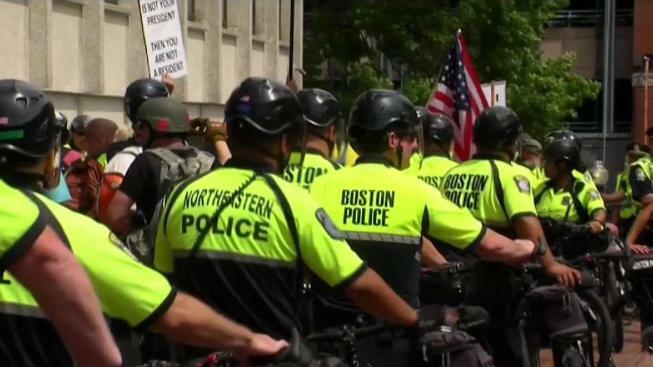 A conservative rally against "far-left violence'' was organized in downtown Boston a year after a similar demonstration drew tens of thousands of counterprotesters. A man, who wished to be identified only as Jon, said they were there to protect the Constitution. "No one here is saying anything hateful or violent," he said. Boston Free Speech, the group organizing the event, said on its Facebook page that its rally was scheduled for noon at City Hall Plaza. The rally spilled onto City Hall Plaza in the afternoon, remaining primarily near the John F. Kennedy Federal Building. A few dozen people with Boston Free Speech were surrounded by more than 100 counterprotesters, who tried to drown them out. "You can have your free speech, but that does not protect you from the consequences," said a counterprotester who wanted to remain anonymous. Brandon Navom, one of the organizers of Boston Free Speech, says they've been falsely labeled neo-Nazis and racists. "All we want to do is come out and peacefully express ourselves," he said. Navom sued Boston Mayor Marty Walsh for slander after last year's rally. "We're trying to engage in an open discourse, and it's these people who want to shut us down," Navom said. A heavy police presence helped separate both sides. There were a few shoving matches quickly broken up by police, but there were no reports of any arrests, serious violence or injuries. The protest lasted less than an hour. Police shut down the rally when the protesters tried to continue into Boston Common because they didn't have a permit. Authorities were seen escorting the group away. The counterprotesters gathered at the State House for a planned march to City Hall organized by Stand Against Hate-Boston and the Democratic Socialists of America. They could be heard shouting "cops and Klan go hand-in-hand." Last August's "free speech'' rally happened on Boston Common days after a white supremacist rally in Charlottesville, Virginia, left one counterprotester dead and 19 injured.